We all very well understand the importance of hygiene in life and for the very same reason; we need to keep our pets clean and well groomed. While bathing and brushing are some of the important aspects of hygiene, an often ignored part is cleaning the dog’s ears. An unclean ear could lead to a host of war problems like building up of extra wax within the dog’s ears, infections, itching, discharge and a lot more. To avoid these complications, it is necessary to regularly keep our dog’s ears free from the dirt build up. But, before we get to the tips, let us first understand the structure of the dog’s ear. Dogs' ear anatomy is a bit different from our own but individual parts are the same. They have L-shaped or a vertical ear with three zones- the inner ear, the external ear and the middle ear. 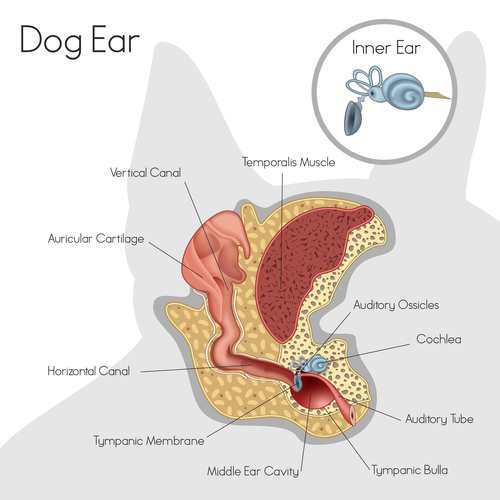 The external flap of a dog’s ear is known as the “Pinna.” Your dog’s ear canal is way below the eardrum, and though it is protected, it needs to be cleaned. Looking at this diagram, one will immediately see that it is not a Shih Tzu. Shih Tzu have a drop down ears whereas the diagram shows prick ears. All dog breeds, however, have similar anatomy, so this picture can represent the breed very well. Otitis externa: This is basically a case where there is an inflammation on the external ear canal. You will notice redness scaly skin often accompanied by discharge from the ears. A bacterial or yeast infection could be caused if there is moisture inside the dog’s ears. It could also be due to decaying foreign matter. Make sure to properly wipe off your dog’s ears after giving him a nice bath. Ear mites are terrible creatures that live in dog’s ears and feeds on the blood from inside your dog’s ears. Any other foreign matter that enters a dog’s ears could also be a major cause of irritation for him. Keeping a close watch on your Tzu's ears will prevent major problems. Look at Cleaning Shih Tzu Ears as just one of those things, like brushing their teeth, that you do to keep your four legged friend happy and healthy. To begin with, ears are extremely sensitive organs and need to be cleaned with extreme caution so that you do not hurt your dog. You can use a good ear cleaning solution, cotton balls, or gauze to clean your dog’s ears. You might also consider keeping cotton tip applicators at your disposal but, be very careful with these- we will explain later in the section why you should be careful with cotton-tipped applicators. You can choose from a wide range of commercially available ear wipes and sprays to best suit the needs of your dog. Before actually getting to the ear cleaning part, you might want to soothe and calm your dog a bit by rubbing his tummy or back. After he is calm, start with the ear cleaning process. You will also want to assemble your supplies and equipment. Have a squirmy or uncooperative Shih Tzu? Try wrapping a bath towel around his body from the neck down including his four legs. This soothes the dog similar to swaddling an human infant. First of all, hold your dog’s ear flap slightly up and put a few drops of the ear cleaning solution on the inner flap which is close to the opening. Next, dip the cotton ball into the ear solution, and the squeeze the cotton ball that is saturated with the solution into the dog's ear. Slightly massage the base of your dog’s ear. This will help to soften and break the dirt that has been built up then, gently clean it out. Use a dry cotton ball to clean the rest if the dirt. After that, allow your dog to shake those ears a bit to allow any remaining dirt to fall off. In the next step, take a lightly wet cotton or gauze with the ear cleaner solution and use it to wipe out the ear canal. Do this very gently. You might consider using a cotton tip applicator, but, only as far as your eye can see because, otherwise, they might cause damage to the ear drums. Repeat this process and wait till all the dirt has been cleared. If some dirt still remains, wipe off the remaining dirt with a cleaning pad, cotton wool or even gauze. Finally, take a cotton ball and dry out your dog’s ear and in the end, make sure that the entire ear canal is dry. Repeat the steps for the other ear as well. Once you are done, do not forget to give your buddy a little treat for his non-resistance and patience. You might also want to note that at times, you might need someone else to help you clean up your dog’s ear. While you regularly clean your dog’s ears, do not overdo it as it may lead to more harm than good by upsetting the natural balance inside the dog’s ears. You can, however, examine your dog’s ears at home often to see if it needs cleaning. Shih Tzu ears have hair that continues to grow from your dog's infancy into old age. Darker haired dogs seem to grow more hair than their light haired cousins. Before attempting to clean your dog's ears using the steps above, examine the amount of hair growing in the canal. Some of the hair may be removed very carefully with scissors, but if the hair is thick, you will need to remove the hair before you clean. There you go the steps to cleaning your dog’s ears and do remember that, while cleaning your dog’s ears may seem to be very easy and pain-free, you still have to be extremely careful. If you see any persistence of foul discharge, inflammation or unusual redness and itching in your dog’s ears, make sure to take him to the vet and have his ear checked. Also, even before the onset of illness, during his regular wellness visits to the doctor, do have his ears examined. After all, our pets deserve our very best love and care. 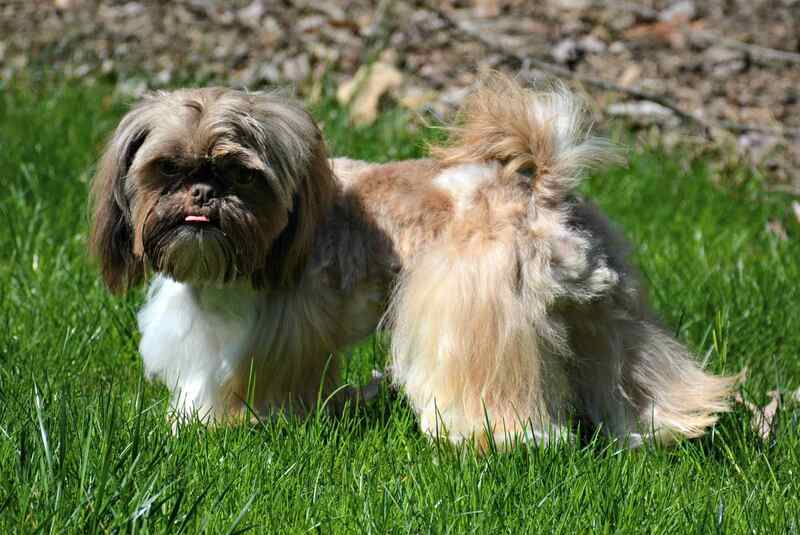 This guest post, Cleaning Shih Tzu Ears, has been contributed by FeedFond. Writing about dogs is what makes them happy! They have tons of articles on dogs and other animals that aim at simplifying lives for pet parents. More of their writings can be found on their website.